I know that I usually do a meatless Monday dish, but I have to be honest with you about something. As the colder temperatures start setting in, I crave heavy, stick-to-your-ribs, food. You know what I'm talking about. The kind of food that not only warms the body, but warms the soul as well. 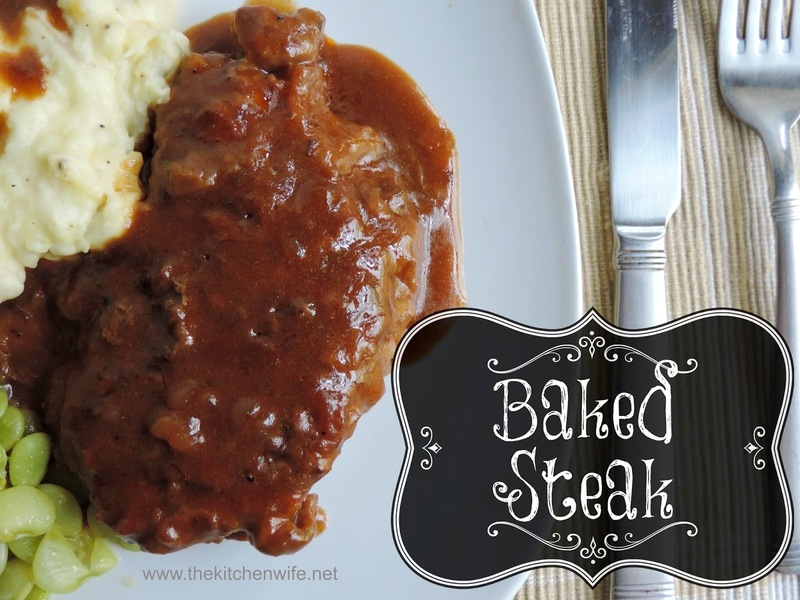 Baked Steak is one such meal for me. The thing with baked steak though is that it can be a little bland. Once you've had one, you've had them all. Until now! This gravy has a little zip that is going to ensure this will be what the troops are asking for all fall and winter long! I can't wait to show you how I did it so let's get started! * If you do not have beef stock or broth feel free to use bouillon or beef base and water. To begin pre-heat the oven to 350 degrees and place a skillet over medium/high heat and add oil. While the oil is heating over the pan, pour the flour onto a plate and season with salt and pepper. Next pat the cubes steaks dry with paper towels and season both sides with salt and pepper. After that dip the steaks into the flour, on both sides, patting the excess flour off. Once you have floured the steaks place them into the hot skillet and brown on both sides. 1-2 minutes on each sides. Once they are brown set the on a place. Add the 2 tbsp. of butter to the pan and let melt. Add 7 of the 8 cups of the beef stock to the pan and using a wooden spoon scrape up all the brown bits off the bottom. Next we are going to add a few things to take this gravy from ordinary to extraordinary. You are going to pour in the ketchup. To the last cup of beef stock add the cornstarch and stir together. This is called a "slurry" and it is what will thicken this gravy, but keep it's glossy shine. Pour it into the beef stock. Whisk the gravy until it starts to thicken. Bring the gravy to a boil, then lower to a simmer and let cook for 10-15 minutes until the gravy thickens. Taste for seasoning and make any adjustments you feel it needs. Once the gravy has thickened, place the steaks back in the pan if it is oven-safe, or place in a baking dish and pour the gravy over them. Place in a 350 degree oven, covered, for 2-3 hours. In the oven this delectable gravy will continue to thicken and develop in flavor. The steaks, oh the steaks, they are going to get so tender that they will literally melt in your mouth. Serve this up with some delicious Company Potatoes and a green vegetable and you have the PERFECT meal. I know you and your family are going to LOVE this Autumn delight so give it a try tonight! Place a skillet over a medium/high heat and add the vegetable oil. Add the flour to a plate and season with salt and pepper. Pat the steaks dry and season both sides with salt and pepper. Dip the steaks in flour, on both sides, and pat the excess flour off. Place the steaks in the hot skillet and brown on both sides for 1-2 minutes per side. Add the butter to the skillet and pour in 7 of the 8 cups of beef stock. Using a wooden spoon, scrape up the brown bits off of the pan. To the beef broth add the ketchup, Worcestershire Sauce, Dijon, and thyme. To the cup of beef stock you have reserved, add the cornstarch and whisk together. Pour the "slurry" into the gravy. Whisk together and bring to a boil. Once the gravy has come to a boil lower it to a simmer and let simmer for 10 to 15 minutes until it thickens. Taste for season and make and adjustments you feel it needs. Place the steak into an oven-safe dish and cover with the gravy. Place into a 350 degree oven for 2-3 hours. That looks like a great stick-to-your-ribs meal! As always, I love your step-by-step photos! I love stick-to-your-ribs meals :) And I love how your recipes are simple enough for a non-cook like me!